We are family farmers — Brian and Justine Denison, our children Suzanna and Maggie. We have been in NY State for twelve years, having moved here from Maine, where for 16 years, we grew over 100 acres of mixed vegetables. Brian is also a forester out of the University of Maine and Justine has taught elementary school, works on the farm, and is a musician. 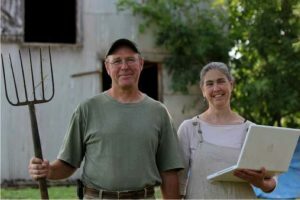 Denison Farm is now USDA Certified Organic (certified by PCO). Our Schaghticoke, NY farm is 164 acres of rich bottomland, wooded ridges, pasture/hayfields, marsh, and streams. The farm has a 26-year history of organic management and CSA marketing started by our much-loved predecessor, Janet Britt.